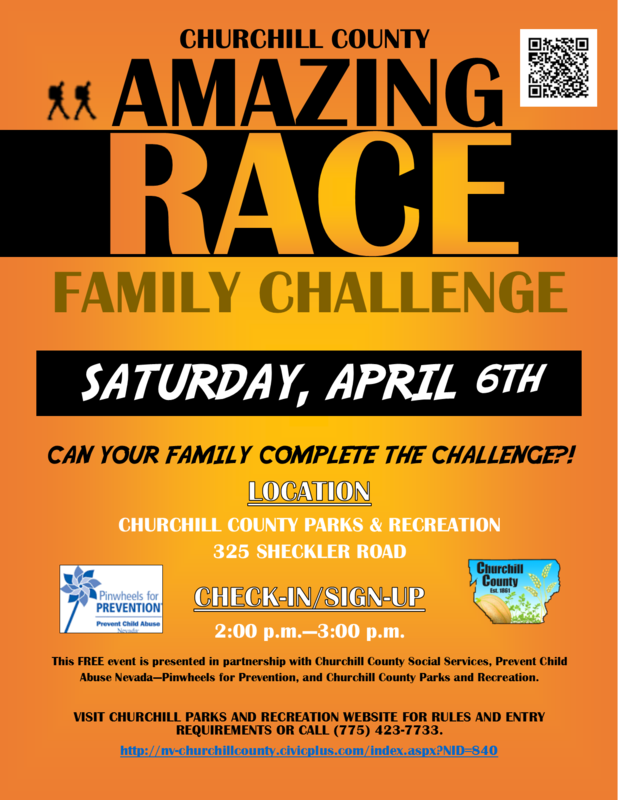 The Amazing Race Family Challenge is a timed team activity that requires participants to complete a number of physical and mental challenges around the Fallon/Churchill County area. The event is presented at no cost and is sponsored in cooperation with Churchill County Social Services, Prevent Child Abuse Nevada - Pinwheels for Prevention, and Churchill County Parks and Recreation. For full details including participation requirements, download the 'Rules and Regulations' document below. Check-In/Sign-Up Anytime Between 2:00 p.m. and 3:00 p.m. The event will require travel throughout the Churchill County area. Teams are required to provide personal transportation to compete. Teams - Teams must consist of 3 to 6 official individuals. Children under the age of 6 may be included or excluded from the official team count as desired to meet the team roster requirement. 2 person teams will be permitted in the "Friends" Division - but will not be timed or eligible for awards. No person may compete on more than one team. Divisions - There are 3 separate divisions. Teams may only compete in one division. Family Division (Adult) - All team members must be related by blood or marriage. At least one adult over the age of 18 is required per team. All official participants are over the age of 13. Family Division (Youth) - All team members must be related by blood or marriage. At least one adult over the age of 18 is required per team. At least half of all official participants on the team are under the age of 13 (rounding up for odd-numbered teams). Friend Division - At least one team member is NOT related by blood or marriage. At least one team member is over the age of 18 or team is able to provide personal transportation and complete all required waivers signed by parents/guardians. Official Participants - All participants considered official members of their teams will be expected to participate in challenges. All challenges should be potentially possible for children 6 and older. In the event that a team cannot complete a challenge due to the participation of a younger child, a time penalty may be accrued and the challenge skipped. This is a family event and challenges are designed to allow for full family participation with simplified versions of activities for younger children. Official Rules for Individual Challenges will be presented at those stations during the Race.